Timeless Treasures Forest Floor Block of the Month 2017. Starting September 10, 2017, you will receive six monthly shipments to create the beautiful 106"x 106"" sampler quilt designed by Toni Steere and Jenny Foltz of Wing and a Prayer Design. 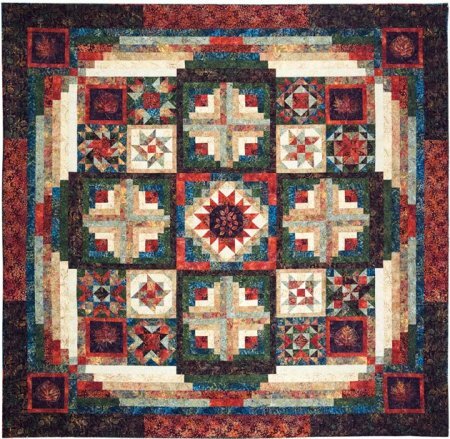 The Tonga Forest Floor quilt is a twist on tradition featuring twelve, 12″ blocks nestled in a log cabin setting. Replacing a standard border is an easy pieced border that frames the quilt interior, showing off the beautiful range of custom-selected batiks. The kit includes batik top fabric, binding, and pattern. The cost is $45.00, plus shipping. Sign up or call us today to join. 605-347-2235. 9:00-5:00 MT.